For the pudding, empty all cups, apart from the milk, into a mixing bowl with the spices. Then, stir in the milk and egg. Once well combined, tip into a buttered 1.5 litre pudding bowl. Cover with a double layer of buttered foil, leaving a pleat in the centre to allow the pudding to rise. Tie the foil securely with string, then place the bowl in a large pan. The pan needs to contain enough gently simmering water to come halfway up the sides of the bowl. Cover with a lid, and steam for 2 ½ hours. If needed during cooking, top up the water if necessary. 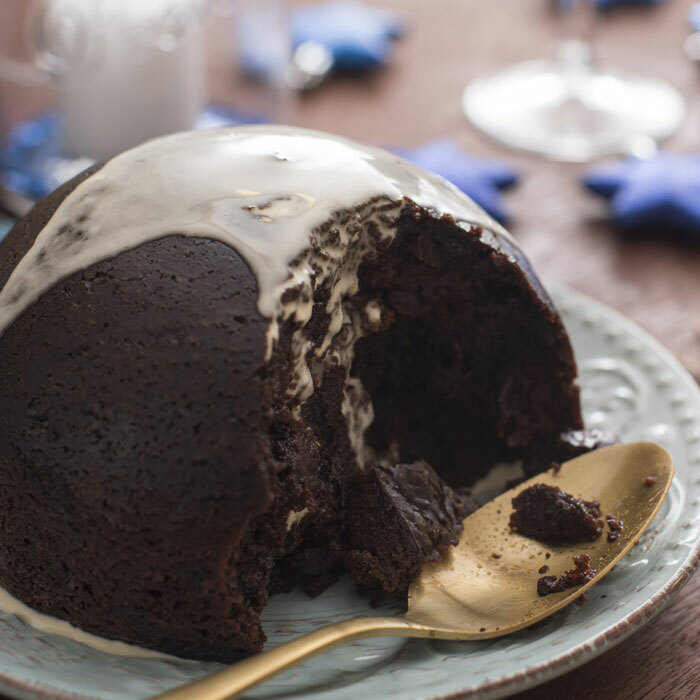 If you are preparing this pudding in advance, once the pudding has steamed, remove the foil, let it cool a little, then wrap in cling film followed by fresh foil. If you are serving immediately, unwrap place onto a deep plate. For the sauce, put the butter, double cream, light muscovado sugar and vanilla extract in a pan. Stir, and bring this to the boil steadily. Allow to bubble for 2-3 minutes, still stirring, until the sugar has dissolved and the sauce is pale caramel in colour and slightly thickened. Remove from the heat. Pour the sauce over the pudding and decorate with mixed nuts.